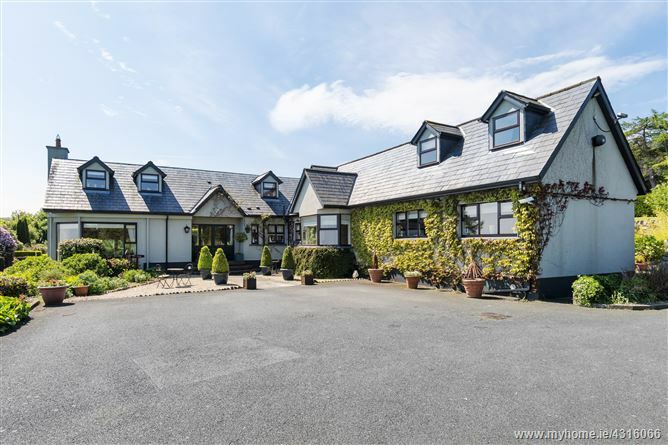 The property is approached via imposing and impressive granite pillared electric iron entrance gates leading to a tree lined driveway with a large parking area to the front of Bracken Dale. The entrance hall is of unusually spacious proportions – establishing a recurring theme throughout this wonderful home. From the hallway a lounge leads to the majestic living/dining room with 270 degree panoramic bow window offering unsurpassed views across Dublin, the Irish Sea and beyond. From the living room double doors access an Amdega conservatory. The kitchen/breakfast / family room area provides a true heart to the house with a traditional bespoke fitted kitchen and bay window seating area overlooking the gardens to the front. From the kitchen there is a wonderful sunroom with vaulted glazed apex ceiling overlooking the sun drenched South West facing courtyard garden and patio to the rear. At this level there are four bedrooms, one en suite and a family bathroom. Upstairs there is a large entertainment/games room leading to the truly spectacular master bedroom suite. The bedroom offers unparalleled views across the surrounding countryside and has the benefit of a walk in wardrobe/dressing room area and en suite bathroom. At this level there are also three walk in attic areas, one which is presently used as a home study.